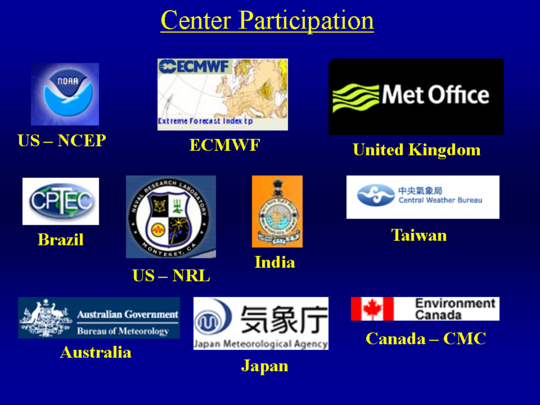 The U.S. CLIVAR program instituted a MJO working group to develop diagnostics related to the MJO during 2006. A subgroup was organized to focus on MJO operational prediction and was tasked to develop a MJO forecast metric for comparison of dynamical models from operational global prediction systems. The activity is housed at CPC where the application, display, and evaluation of these MJO model forecasts is being done. During 2010, the group was reformulated as the WCRP/WWRP THORPEX YOTC Task Force. This website will see updates as additional models become available and verification statistics generated. The products at this site are to be considered EXPERIMENTAL at the current time. A key for the label headings in the figure box is provided below. Click on the headings for additional information for specific model-related information such as the number of ensemble members, forecast duration and climatologies used. Note: Move cursor over product name to display. Click for additional information. The methodology for the creation of the phase space plots above follows closely to that described in Wheeler and Hendon (2004) (hereafter WH2004). A notable difference between WH2004 and the procedure employed here is that the linear removal of the ENSO signal (related by the BMRC SST1 index) is not performed. After discussion among the MJOWG members, it was decided that this step was not necessary as the subsequent removal of the 120-day mean is sufficient to remove much of the interannual signal. The table below illustrates the current participation in the activity which is in varying stages for each of the participating centers. Various models are provided and include datastreams consisting of a varying number of ensemble members and forecast duration. The US CLIVAR MJO Working Group plans to verify these forecasts in realtime using the bivariate correlation and root-mean-square error between the observed and forecasted RMM indices as described by Lin et al. (2008). See below for expressions and an example. Note: Move cursor over product name to display. Click for larger size and info. Wheeler M. and H. Hendon, 2004: An All-Season Real-Time Multivariate MJO Index: Development of an Index for Monitoring and Prediction, Monthly Weather Review, 132, 1917-1932. Gottschalck, J., M. Wheeler, K. Weickmann, F. Vitart, N. Savage, H. Lin, H. Hendon, D. Waliser, K. Sperber, M. Nakagawa, C. Prestrelo, M. Faltau, and W. Higgins, 2010: A Framework for Assessing Operational Model MJO Forecasts: A Project of the CLIVAR Madden-Julian Oscillation Working Group. Bull. Amer. Met. Soc., In press. Gottschalck, J., M. Wheeler, K. Weickmann, D. Waliser, K. Sperber, F. Vitart, N. Savage, H. Lin, H. Hendon, M. Faltau, 2008: Madden-Julian Oscillation Forecasting at Operational Modelling Centres. CLIVAR Exchanges, 13, October 2008. Lin, H., G. Brunet, and J. Derome, 2008: Forecast skill of the Madden-Julian Oscillation in two Canadian atmospheric models. Mon. Wea. Rev., 136, 4130-4149. Goswami, B.N., Wheeler, M. C., Gottschalck, J. C. and Waliser, D.E., 2008: Intraseasonal Variability and Forecasting: A Review of Recent Research. The Fourth International Workshop on Monsoons, IWM-IV, 20-26 October 2008, Beijing, China.